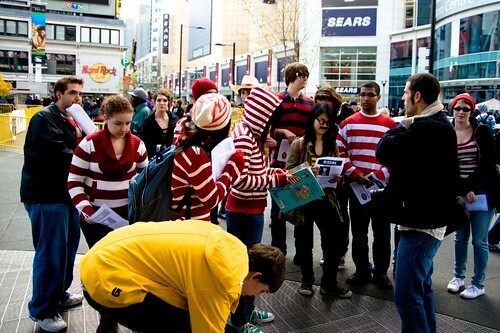 A bunch of folks organized a game of Where’s Waldo at the Toronto Eaton Centre. Chaos ensued and fun was had by all. Buddy Ruddy has organized the 2nd annual Mob of Waldos on Facebook! Come on out to re-create the most difficult Waldo puzzle ever! 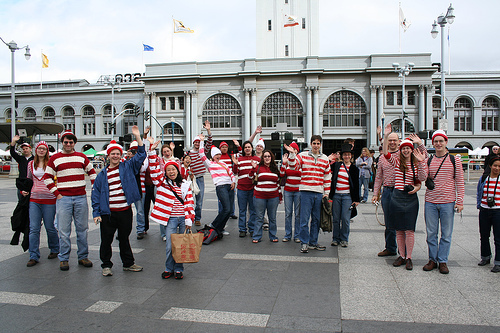 Come dressed in a red and white striped shirt and blue pants and meet other Waldo fans! This event will occur rain or shine. If it rains, we will congregate inside the Ferry Building. 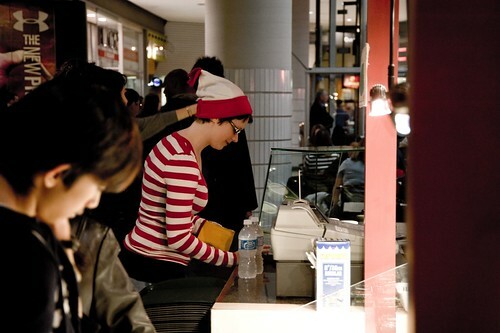 Arrive dressed as Waldo or Wenda and participate in re-enacting the scene of the most difficult Waldo puzzle ever. Come in a red and white striped shirt, blue pants and your choice of accessories and meet other Waldo fans! Children of all ages. Be sure to bring your friends! Dress code in effect… yes photographers and videographers, this means you too! Tag your photos with “mobofwaldos”. If you’re on Flickr, you can add your photos to the Mob of Waldos pool. 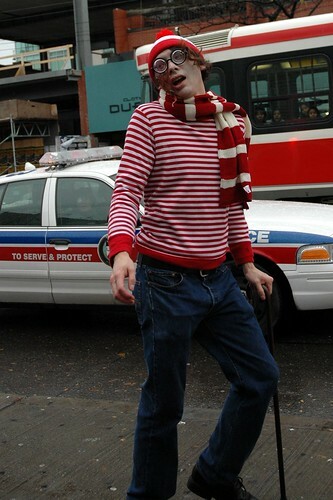 I was Waldo for halloween this year. I got a cheap white long sleeve shirt from WalMart for 10 bucks. 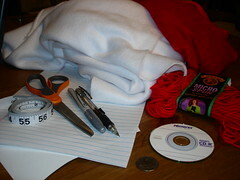 Then I picked up some red fabric dye from a craft store (Rit brand dye #5 scarlet). 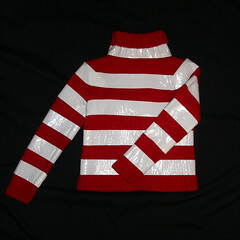 I used masking tape to mask off white stripes on the shirt and then used a spray bottle filled with the dye mixture to “spray paint” the red stripes until I got an even dye job (it’s good to stick a piece of cardboard inside the shirt while you do this so the dye doesn’t mess up the other side). 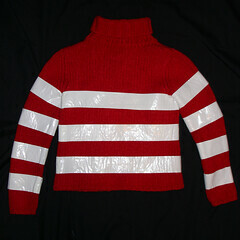 Once the shirt was dry, I peeled off the masking tape and got fantastic red/white stripes. 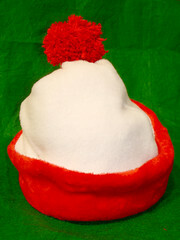 I did the same with a white beanie and then safety pinned a pom-pom I made out of strips of cut felt. Total cost: about $20. I probably could have pulled it off for cheaper if I already had the shirt and beanie. Those both cost $17. For a limited time, you will be able to order a package of free business card sized fliers to tell your friends about Mob of Waldos. Simply fill out the form in the Spread the Word section and I will send some cards to you. Can’t wait for the fliers to arrive by snail mail? You can also print out your own fliers by downloading the PDF. Start with a red shirt and white duct tape. If you are applying the tape before you put on the shirt, you should use a loose-fitting shirt because the fabric will not stretch after the tape is applied. 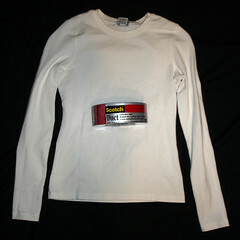 You may use a fitting shirt if you are going to put the shirt on before you apply the tape. When using the latter method, you will have to remove the tape before taking off your shirt. 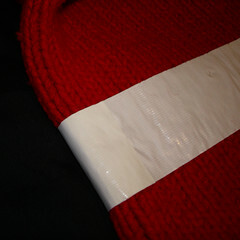 You may also use a white shirt and red duct tape, or a shirt of any color and both red and white duct tape. 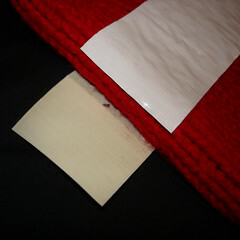 In this example, I will be using a red shirt and white tape. Starting just under the armpits, loosely apply tape around the torso and arms individually. Leave a space below that is the same width as the tape you have just applied and apply additional rows of tape until you reach the cuffs of the sleeves and the hem of the shirt. For a professional look, ensure that the ends of the duct tape precisely over lap each other. Continue applying tape to the upper torso. 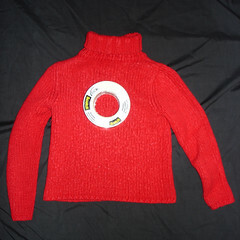 If using a turtleneck, you may want to stretch out the collar to the size of your head before applying the tape. I have added a link to a page of bookmarked Odlaw costume items in the “Costuming Resources” section on the right. Yes, evil villains are welcome to participate in Mob of Waldos, too! I just heard through the Something Awful grapevine that some people are thinking of participating in Mob of Waldos as Zombie Waldos… which will be so awesome! If anyone is up to it, I’d like to see some Pirate Waldos and Ninja Waldos too!